⌐오랫동안 수원시민의 여가활동 거점이었던 호수가에 위치한 이 프로젝트의 목표는 시민들이나 거주자들에게 자주 찾아오고 싶어 할 대표적인 장소를 만드는 것이다. 이 목표를 위하여 대지의 최고 3개층 높이의 차이를 갖는 지형을 고려하여 호수변 산책로와 직접 연결되는 상업기능과 이벤트 공간, 숲, 산책로 ,포켓 중정들을 배치하였다. 도시인의 라이프 사이클과 수요를 고려하여, 테라스타입 오피스텔과 타워형 오피스텔을 구성하였고 거주의 아늑함과 프라이버시를 확보한 주거단지는 단위세대들이 골고루 인근 두 개 호수공원 일대를 전망할 수 있고 랜드마크 성격의 고층 주동 타워로 설계하였다. 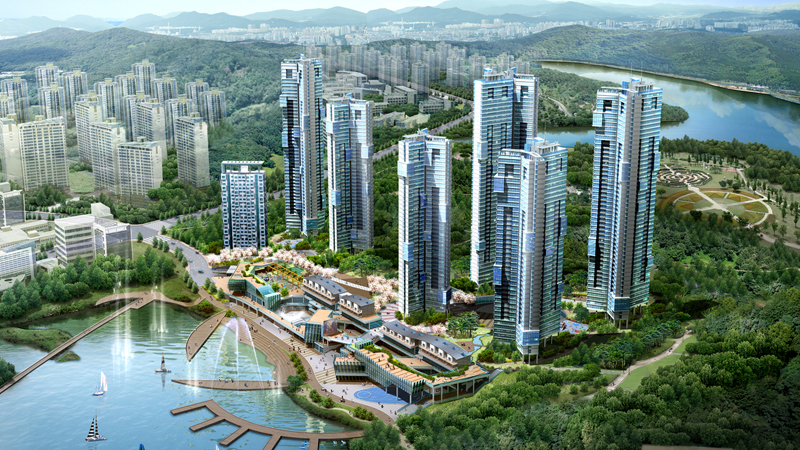 ⌐The goal of this project was a stronghold of the lake, located in Suwon Civil leisure activities for a long time, it will make a major place to find frequently wanted to come to the citizens or residents. To this strategy, using the terrain with differences in geometric level, it was arranged commercial features that connect directly to the shores trails and event space, forests, trails, pocket courtyards. Taking into account the life cycle and the demand of a city, configure the terrace and tower type officetel and a residential complex ensuring the comfort and privacy of a residence was designed to view the two evenly nearby lake Park.